Arp 299 is a system where two galaxies are in the process of merging. Chandra data has revealed 25 bright point-like X-ray sources in Arp 299, 14 of which are categorized as "ULXs". These ULXs are likely binary systems where a black hole or neutron star is pulling material from a companion star. This is one of the highest numbers of ULXs in a galaxy in the nearby universe, caused by a high rate of star formation triggered by the merger. What would happen if you took two galaxies and mixed them together over millions of years? A new image including data from NASA's Chandra X-ray Observatory reveals the cosmic culinary outcome. Arp 299 is a system located about 140 million light years from Earth. It contains two galaxies that are merging, creating a partially blended mix of stars from each galaxy in the process. However, this stellar mix is not the only ingredient. New data from Chandra reveals 25 bright X-ray sources sprinkled throughout the Arp 299 concoction. Fourteen of these sources are such strong emitters of X-rays that astronomers categorize them as "ultra-luminous X-ray sources," or ULXs. These ULXs are found embedded in regions where stars are currently forming at a rapid rate. Most likely, the ULXs are binary systems where a neutron star or black hole is pulling matter away from a companion star that is much more massive than the Sun. These double star systems are called high-mass X-ray binaries. This buffet of high-mass X-ray binaries is one of the richest in a galaxy located in the nearby universe, but Arp 299 contains relatively powerful star formation. This is due at least in part to the merger of the two galaxies, which has triggered waves of star formation. The formation of high-mass X-ray binaries is a natural consequence of such blossoming star birth as some of the young massive stars, which often form in pairs, evolve into these systems. 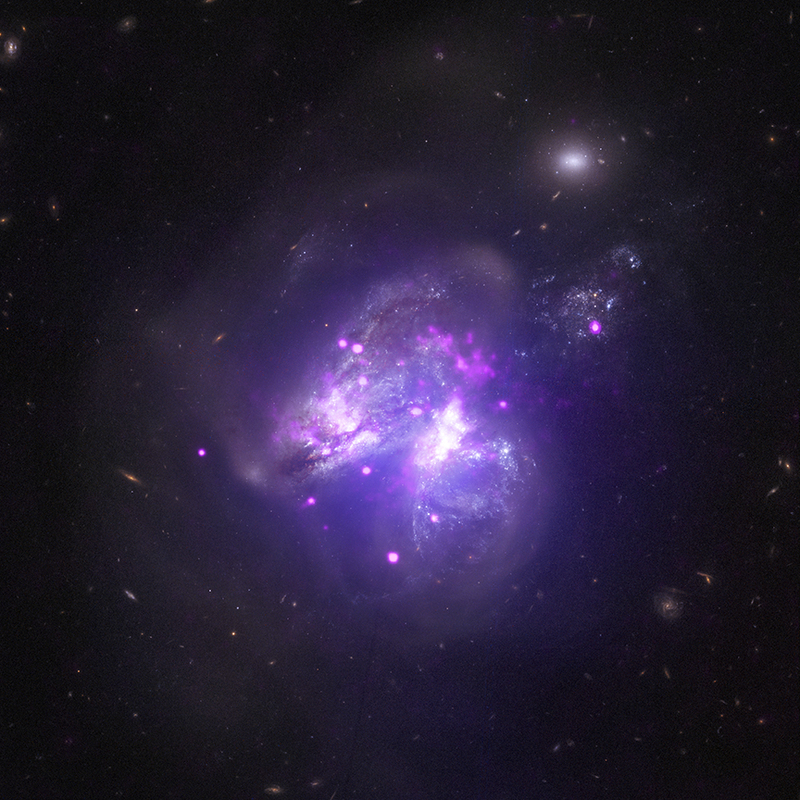 This new composite image of Arp 299 contains X-ray data from Chandra (pink), higher-energy X-ray data from NuSTAR (purple), and optical data from the Hubble Space Telescope (white and faint brown). Arp 299 also emits copious amounts of infrared light that has been detected by observatories such as NASA's Spitzer Space Telescope, but those data are not included in this composite. The infrared and X-ray emission of the galaxy is remarkably similar to that of galaxies found in the very distant Universe, offering an opportunity to study a relatively nearby analog of these distant objects. A higher rate of galaxy collisions occurred when the universe was young, but these objects are difficult to study directly because they are located at colossal distances. The Chandra data also reveal diffuse X-ray emission from hot gas distributed throughout Arp 299. Scientists think the high rate of supernovas, another common trait of star-forming galaxies, has expelled much of this hot gas out of the center of the system. A paper describing these results appeared in the August 21st, 2016 issue of the Monthly Notices of the Royal Astronomical Society and is available online. The lead author of the paper is Konstantina Anastasopoulou from the University of Crete in Greece. NASA's Marshall Space Flight Center in Huntsville, Alabama, manages the Chandra program for NASA's Science Mission Directorate in Washington. The Smithsonian Astrophysical Observatory in Cambridge, Massachusetts, controls Chandra's science and flight operations. Scale Image is 2.8 arcmin across (about 117,000 light years). Coordinates (J2000) RA 11h 28m 31.33s | Dec 58° 33´ 41.80"
What we can see is just a tiny bit of the whole universe, and just in optical waveform, but thank to technology nowadays, we can see much more than that, it is very beautiful. A system where two galaxies are in the process of merging. About 140 million light years from Earth. 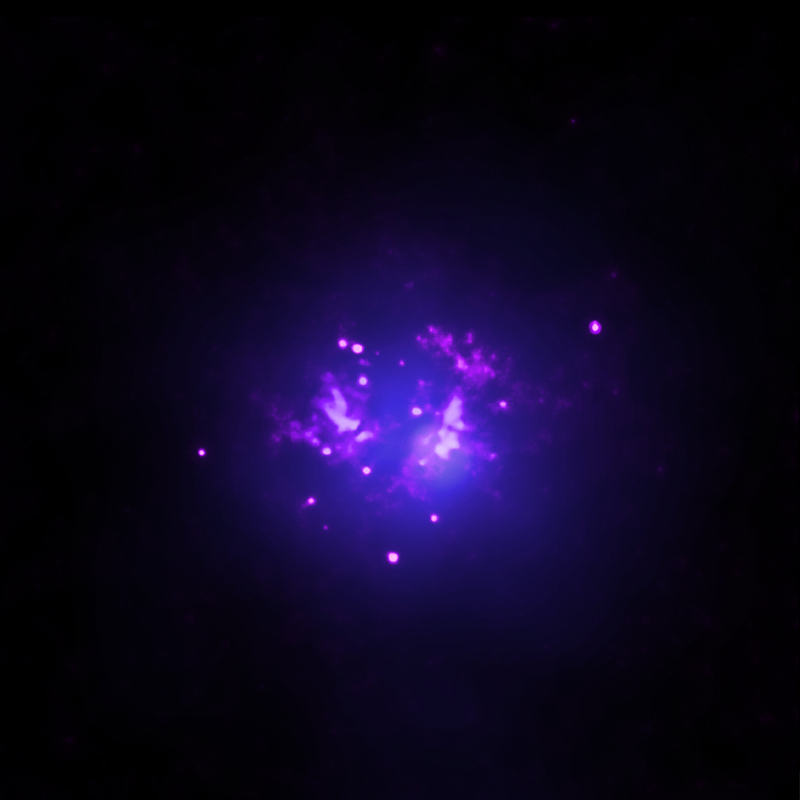 X-rays from Chandra X-ray Observatory and NuSTAR, optical data from other telescopes. About 117,000 light years light years across.